Lost in Editing – An Author peeks out! | AUTHOR. ACTOR. SWORDSMAN. Lost in Editing – An Author peeks out! 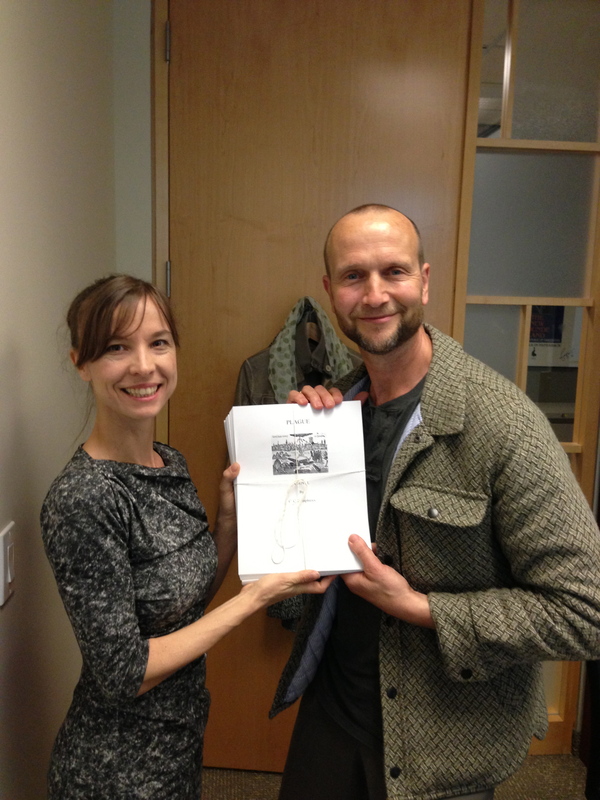 Here’s me, delivering the manuscript of ‘Plague’ to my editor, the wonderful Nita Provonost, in her office at Random House in Toronto. This was in June, and the reason why I have been so rarely glimpsed in posts since then is that Nita sent it back to me two weeks ago, with notes. Once I get those I hide in my hut and only emerge to gnaw the odd bone. I love this stage, the tweaking, the enhancing, especially when the notes are as spot on as hers. But my obsession means my own family rarely see me – so anyone following my blog loses sight of me too. Nearly done though. One more week and I can leave the hut. And make a few more entries here. For those who don’t know, I have moved to Random House for my next two books – and hopefully many more. ‘Plague’ and ‘Fire’ are a pair of thrillers – religious fundamentalist serial killer stories set against two of the most devastating events of English history: the Great Plague and Great Fire of London 1665-1666. I am having a total blast writing them. ‘Plague’ will be published in the UK and Canada in July 2104. Here’s something from the Daily Telegraph UK this week – the houses that survived the Great Fire and still stand. I want to visit every one! This entry was posted in Uncategorized and tagged editing, historical fiction, novels, publishing news, Writing, writing tips. Bookmark the permalink.